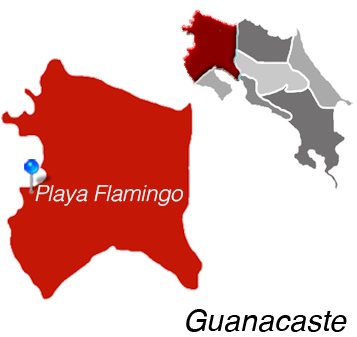 Playa Flamingo Real Estate offers some of the best ocean view condominiums and developments in all of Costa Rica. All of these developments are located in the heat of Flamingo and are walking distance to Flamingo Beach, Shops, Restaurants, and the new proposed Flamingo Marina. 360 Splendor Del Pacifico Residences will be a one of a kind investment opportunity having the amenities of a five star hotel with the privacy and comfort of a luxury condominium. The residences consist of a combination of luxury one bedroom,three bedroom and 3 bedroom penthouses that have roof rights. There is nothing like this in the area. From 360 Splendor Del Pacifico Residences, you can see 10 different beaches, and the new site for Playa Flamingo’s Marina that will be home to some of the best fishing boats and luxury charter yachts. The start of 360 Splendor Del Pacifico Residences took place in 1998 when Ed Podolak and his business associates acquired the premier piece of land on the North Ridge of Playa Flamingo. Ed is no stranger to developing prime real estate, as he has completed luxury condominiums in Aspen, Colorado, USA and Jaco, Costa Rica. 360 Splendor del Pacifico Residences will be completed November, 2017. The new Marina will be well under construction by then, making 360 Splendor Del Pacifico Residences even more desirable as an investment or second home. The Palms is located right on Flaming Beach and offers a 5 star resort feel and services. For those buyers who are looking for beachfront in Playa Flamingo, look no further. These Villas, are secluded and are located at the far end of the beach. They offer 2 and 3 bedrooms layouts. The Palms has become Costa Rica's most prestigious beach front address. The Palms is quite simply unmatched. Finished include Viking appliances, granite countertops, custom millwork and cabinets, and overall attention to detail throughout. Natural Costa Rican materials have been combined with old world craftsmanship to create this stunning development. Its gardens are adorned with an array of exotic plants, beautiful tropical flowers and stately Royal palms. Amenities include on on-site gym. Pricing for a 2 bedroom villa start at $900K. Oceanica Resort has some of the most beautiful ocean views in Playa flamingo. Choose between 2-3 bedroom layouts. 2 bedrooms start in the $325K range. Oceanica is very sought after because of it's central location in Playa Flamingo and it's proximity to the beach. You can hear the waves break from your condo. It's located less than a two-minute walk to the the white sand beach of Playa Flamingo. In addition, there are restaurants, and grocery stores within walking distance. The Oceanica Resort condos have a nice large swimming pool, 24 hour security and private outdoor parking. Flamingo Towers is one of KRAIN's favorite condominium buildings in Playa flamingo. Located on the South ridge of Flamingo, it offers some of the most incredible sunsets in all of Costa Rica. We have had guest say that it is almost a religious experience witnessing the sunsets from these condos. Flamingo Towers consist of 2-3 bedroom layouts starting at $230K. Two pools are onsite and the units come with covered parking, which is a big plus. KRAIN has sold over 10 units in this building and all of our clients are very happy. KRAIN is the exclusive listing brokerage for this development. We have three ocean view units remaining for sale. We also mange multiple units in this development. Call us today for more information or ROI numbers. Presidential Suites, located in the heart of Flamingo is another great purchase option. 2-3 Bedroom ocean view condos options are available. Centrally located in Playa Flamingo, these condos are 3 minute walk-to-beach. They are larger than most condos being around 1700 SF and have oversized balconies. Some unit are duplexed and other are single floor. Both Layouts are very nice. Some of the units in this building are original and are in need of a remodel. Units come with outdoor parking. Original units are staring at $250K, while remodeled units are start at $350K. KRAIN manages multiple units in this development. Call US today for more information. Flamingo Marina Resort is beachfront! Owners and guest enjoy direct access to a small secluded beach. Investor have been buying these units in anticipation of the new Flamingo Marina. Owners will be able to step out their unit and be at their boat in less than 2 minutes by walking. This development has seen a rebirth of interest and many new owners are completely remodeling their units. Pricing in this development have been on the rise. Only a few units remain at discounted prices. Call us today to see our current inventory in this development. KRAIN also manages units in this development and can give a projected ROI. These 2 bedroom villas are steps to Playa Flamingo Beach. The condition of these units range from original to recently remodel. Pricing on these units start in the $250K range. The master bedrooms have a peak-a-boo ocean view. These units have great rental potential. The resort style pool is a main attraction at this development.